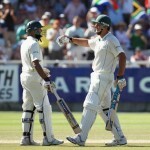 South Africa 4-325 (Hashim Amla 106*, Faf du Plessis 69*, Graeme Smith 54, Doug Bracewell 2-70) vs. New Zealand. 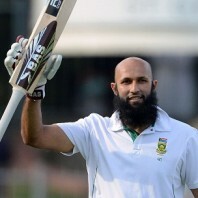 The top order batsman of South Africa, Hashim Amla, plundered another Test ton and strengthened the position of his team in the opening match vs. New Zealand. South Africa amassed 325 runs in 90 overs for the loss of just four wickets on first day of the Test. The First Test of the two match series commenced on January 11, 2013, at St George’s Park, Port Elizabeth. Earlier, Graeme Smith, the captain of South Africa, won the toss and came into bat with Alviro Petersen. The batsmen had a cautious beginning of their innings as the Black Caps bowlers maintained their line and length. The first wicket associated for 29 runs when Petersen was caught by Jeetan Patel at fine leg off Doug Bracewell for 21. The run machine of the Proteas, Hashim Amla, joined in next with Smith and managed just two runs on the first 12 balls he faced. Smith remained watchful at his end while adding useful runs and the pair found few boundaries in between their innings. The duo added 10 runs in the 27th over with a couple of fours and the first hundred of the innings appeared on the screen in the next over. Graeme Smith dispatched his 36th Test half century in the 29th over with 2 fours but was caught behind by BJ Watling off Neil Wagner for 54 from 88 balls with 8 fours. Jacques Kallis was gone cheaply after scoring eight runs as AB de Villiers got together with Amla who was dropped at gully by Kane Williamson off Trent Boult at 48. The batsman made full use of the chance and went past his fifty three balls later with a four. AB de Villiers kept on cruising from the other end as the score board displayed 200 runs in the 57th over. 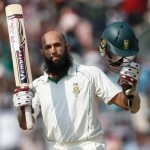 Hashim Amla secured his end as de Villiers attained his 31st Test half century in the 61st over and became the next victim at 51 as the score reached 223 runs. 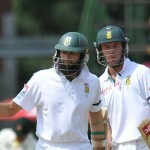 The young gun of the Proteas, Faf du Plessis, was the next batsman in and survived a few anxious moments at the crease. Hashim Amla blasted his 19th Test century on the second ball of the 83rd over with a four as du Plessis was doing well at the other end. The third hundred of the South African innings was posted on board with a six from du Plessis in the 86th over that also earned him a third Test fifty in the fourth match. Faf du Plessis hit another 2 fours in the next over and remained unbeaten for 69 off 112 deliveries with 1 six and 8 fours. 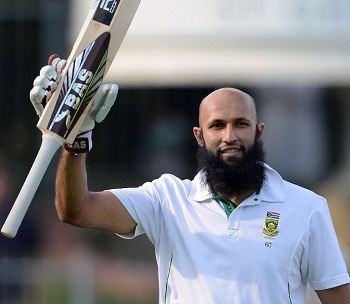 Hashim Amla was as solid as rock at his end with 106 from 211 comprising 8 fours as the hosts reached 325 in 90 overs with six wickets still in hand. Doug Bracewell was the most successful bowler with two wickets whereas Neil Wagner and Jeetan Patel claimed one wicket. South Africa is in a strong position and New Zealand has to get a few early wickets on day two if they want to come back to the game.